A colorful plate of roasted veggies brighten any table and offer something for everyone! Perfect for feeding a crowd or for meal prep. Roasted some veggies for dinner and the week but didn’t have time to plate and photo… so sharing this larger and prettier platter I made recently for dinner with my parents & brother’s family. This colorful plate had something for everyone including everyone’s favorites. 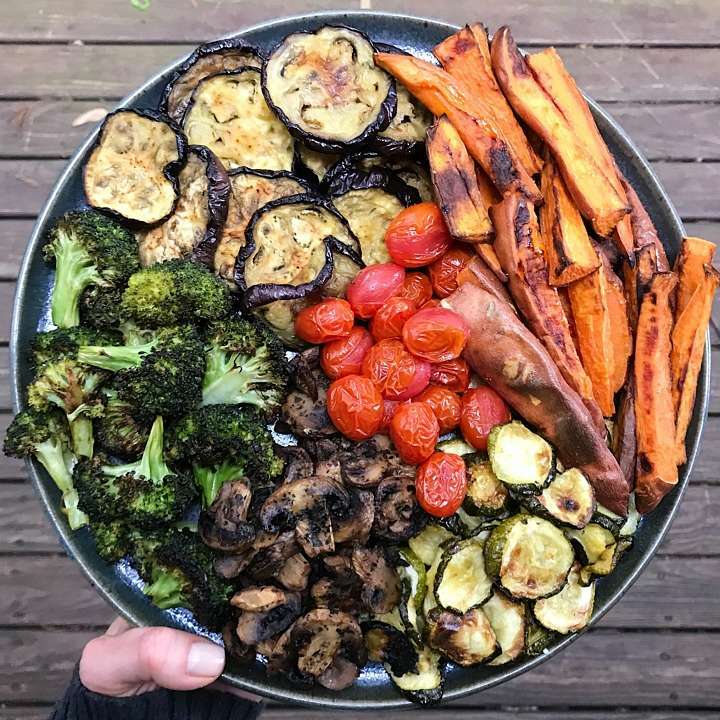 The details…Crispy Sweet Potato Fries, Roasted Zucchini, Roasted Basil Mushrooms, Roasted Broccoli, Roasted Eggplant and Roasted Cherry Tomatoes . Roasted veggies are one of my favorite foods to prep each week and have in the refrigerator because they are so versatile. They can be eaten room temperature or heated up (I like to heat them up in a skillet so that they get crispy). My husband and I love to eat them for lunch as part of a big salad, alongside zoodles or with just some hummus or avocado. No matter how you enjoy them, they are always good to have in the fridge. Here are some tips for making a platter and getting them crispy every time! Place them on the baking sheet so that they are not touching and with enough space in between each vegetable so that they can get crispy. Roast them at a high temperature (I like to roast them at 400 degrees, except sweet potato fries which I like to roast at 450 degrees if possible). If short on time, roast at 425 degrees, but do for shorter time. My general rule of thumb is to roast at 400 degrees, for 30 minutes. Some vegetables will take a little longer, some a little less but this will work for most veggies. If serving a crowd, consider asking people what their favorite vegetables are ahead of time. That way you can make sure you have enough of the preferred vegetables. If making a platter, choose your favorite vegetables first, look at the colors and then choose a few with different colors so the platter is balanced and vibrant in presentation. 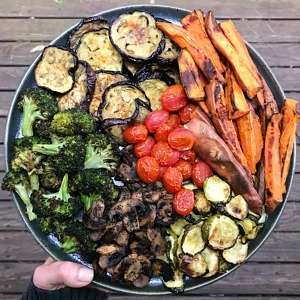 Scroll down for recipe and leave a comment if you love roasted veggies too! A roasted vegetable platter is always a good idea. It adds color, nutrients and works well with just about everything. Perfect for entertaining or for meal prep so that you have a stocked fridge ready for any meal. Quantity depends on number of people serving. For all: Clean, dry well and leave skin on. The most important thing is to cut vegetables in similar thickness to make cooking easier. Tomatoes - 10 minutes or until tender. Mushrooms - 25 minutes or until tender. Zucchini- 30 minutes or until tender and just starting to crisp. Eggplant - 30 minutes or until tender and just starting to crisp. Store each vegetable separately in air tight containers in the refrigerator for several days. Serve at room temperature or heat up in a skillet.